Bloomsbury Mansions was converted into flats in the late 1990's - mainly sold off plan abroad. They have had some famous residents including Ricky Gervais, who owned one of the penthouses. From the moment you walk in the front door you can feel the New York apartment block vibe. The flats are all modern with large windows and high ceilings, there are 2 passenger lifts serving the 59 flats. 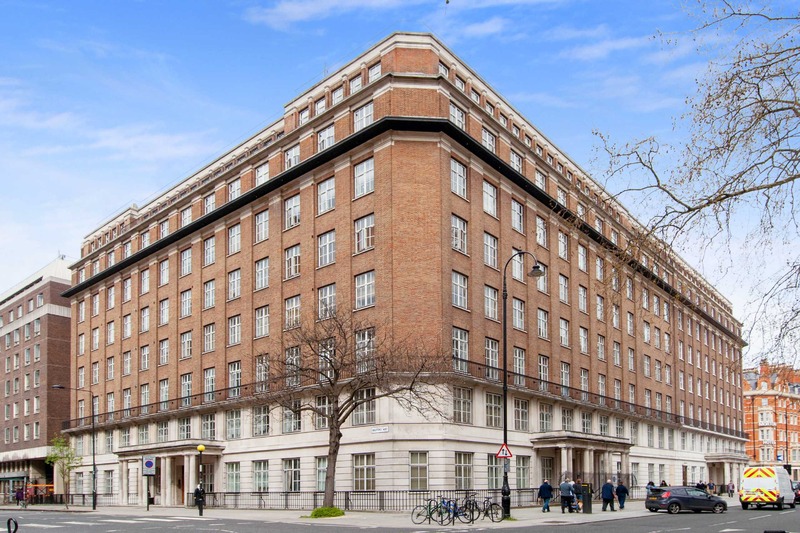 This grand block overlooks Russell Square which is adored by sun seekers (when it appears in the sky) and is a marvellous setting for Central London living. Just a short walk south and you're in Theatreland ideal to catch a pre theatre meal and get home at a reasonable hour. The building provides easy access to both the City and the West End as well as transport links out of London including Eurostar. The much revered Brunswick Centre is located close by too with its sizeable Waitrose, Renoir Cinema, restaurants and cafes including Pattisserie Valerie, Itsu and Carluccio's, as well as high Street retailers including GAP, Office, LK Bennett and Space NK. The square in the centre is popular for al-fresco dining and provides visitor's and residents with a nice place to have lunch and socialise. In the basement you have car parking spaces (although not every flat has a space), a small gym, sauna and jacuzzi. The building is looked after by the porter, the enigmatic Paul who has been there since 2004. Do you live in Bloomsbury Mansions?